Hi, everyone! This is “It is Easy to Cook” channel. Today we are making the famous honey sponge-cake.. I'll tell you the difference between cake on soda and without it..
See the list of ingredients below the video!. Separate a room temperature whites from the yolks..
Add a pinch of salt into the whites and whisk until a thick stable foam..
Add 1/3 of sugar. Mix.. The white got thicken. Divide the rest of the sugar in two and add half of it. Mix.. The white got thicken. Sugar does not dissolve. Do not try to dissolve it completely..
Whisk the yolks until they grow in size and get light..
Yolks brightened. Add the rest of the sugar. Stir. Add honey.. The cake will have the same taste as honey, which is put inside.. Choose the honey you like..
Stir it. You can whisk it at high speed..
Stir it with a silicon or wooden scapula..
Sift flour little by little into the mass. Stir it in one direction only..
See how many bubbles! The dough is very lush..
You can use a mixer at a very slow speed to mix the mass to avoid lumps.. The dough is ready. Cake rises up to 5 cm..
What's the difference in adding soda or baking without it?. If you add baking soda or baking powder the cake will rise up 2 cm higher than usual.. So, without soda the cake will have 5 cm. and you will cut it into 3 shortbreads. With soda you will cut it into 4 shortbreads..
You can bake it both in the oven or in a slow cooker..
Today I am baking in a slow cooker and I will add a tsp of baking powder..
Preheat the oven up to 338 degrees F. Bake the cake for 30-35 minutes. Check the readiness with a wooden toothpick.. In a slow cooker set - "Baking" mode, 50 minutes. After that leave it for another 15 minutes under the lid closed.. Grease the bottom and the sides of the cooker with butter.. If it is an oven, lubricate the bottom. But if you bake on a baking paper - don't grease it.. The dough is in the mold. There are lots of bubbles. 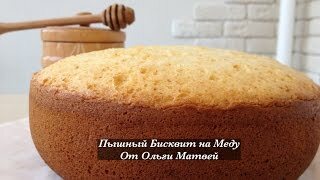 Soda and honey gives a very air texture..
On my channel there are honey cake with honey shortcakes and soda. The dough ferments for 3 days. Shortcakes gets very lush and soft.. I gave a link, be sure to check.. The cake is baked. The smell is incredible, creamy honey..
Smear it with any cream or butter cream, custard when it is completely cool.. Thank you for being with me today. Thank you for subscribing to my channel. "Like" my video if you enjoyed it. Bye, bye!